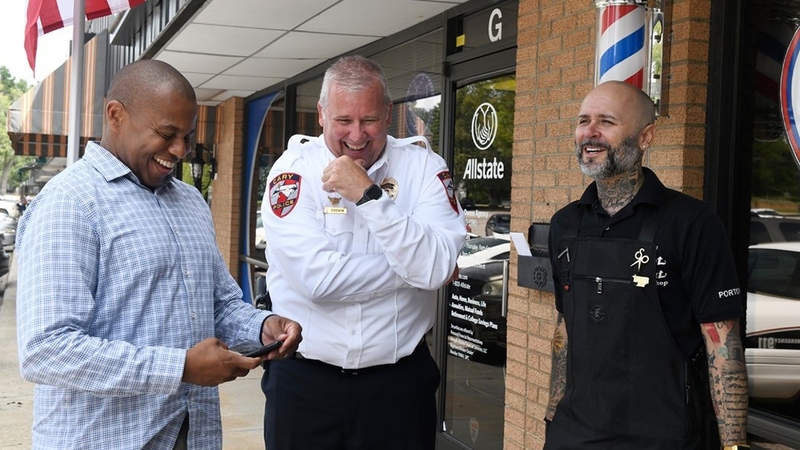 Tru Pettigrew, left, Cary Police Chief Tony Godwin, center, and Jesse Padilla talk during the annual Kuts for Kids event. 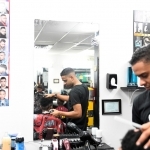 Pettigrew leads monthly barbershop rap sessions, where police and members of the community can air their concerns. Four years ago, in the aftermath of protests against police in Ferguson, Mo., two local men decided that something needed to change. Tru Pettigrew, a Cary businessman and father who had grown up in Baltimore, worried how his son would be treated by police. Jacques Gilbert, an Apex police captain from a black community, understood the fear and distrust on both sides. 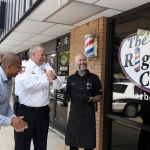 While Cary and Apex are far different from Ferguson, Pettigrew and Gilbert each began efforts to improve the relationship between law enforcement and minority communities in their own neighborhoods. Four years later, their work has changed lives here, and their messages are spreading beyond Western Wake. 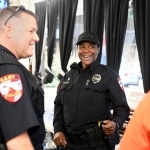 After 25 years on the Apex police force, Gilbert knew that two things needed to change in law enforcement — diversity and training. He launched Blue Lights College in 2014 to encourage more minorities to become police officers and to teach them to serve with compassion. 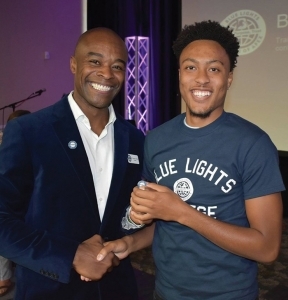 “Establishing Blue Lights College was a way to pull young men and women from communities that historically have feared the police,” said Gilbert, who retired from the force in July. Now the president of Blue Lights College, Gilbert targets 18- to 20-year-olds who aren’t sure what to do after high school. The two-year, tuition-free program provides structure for teens who might be tempted to make poor choices that would disqualify them from police training. Roughly 70 students are enrolled in the fall 2018 term, taking classes that include communication, conflict resolution and mental health first aid. Most classes are online, with about a quarter being held in-person at local churches. The class locations fit nicely with the school’s core principles — faith, purpose and trust. “We believe that compassionate policing is the way to solve problems,” said Gilbert. After finishing at Blue Lights College, students can begin Basic Law Enforcement Training at Wake Technical Community College which provides the training at no cost. The Apex school also partners with police departments in the Triangle and beyond to place its graduates. 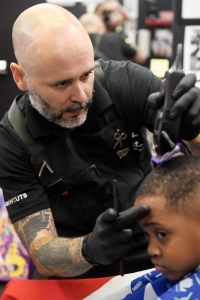 Jesse Padilla, owner of The Right Cut Barbershop, gives a haircut to Tyson Oglesby, 6. Padilla has hosted an annual Kuts for Kids event for five years, working with a team from radio station WQOK-97.5. 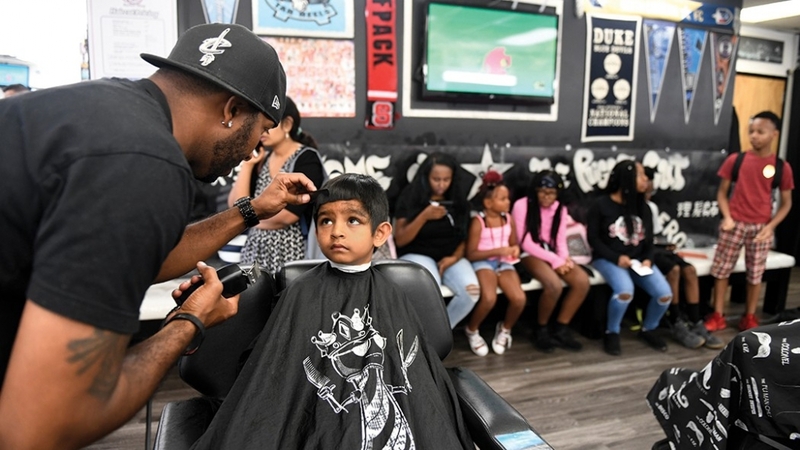 More than 60 backpacks of school supplies were given out at the August event, and 37 children came to the Cary shop for back-to-school haircuts. Pettigrew had never had a negative experience with Cary police, but based on his experiences in Baltimore and Los Angeles, he wondered if he and his family would be treated fairly in this mostly white, affluent community. He took his concerns to the Cary police department, asking how they planned to address the issue. 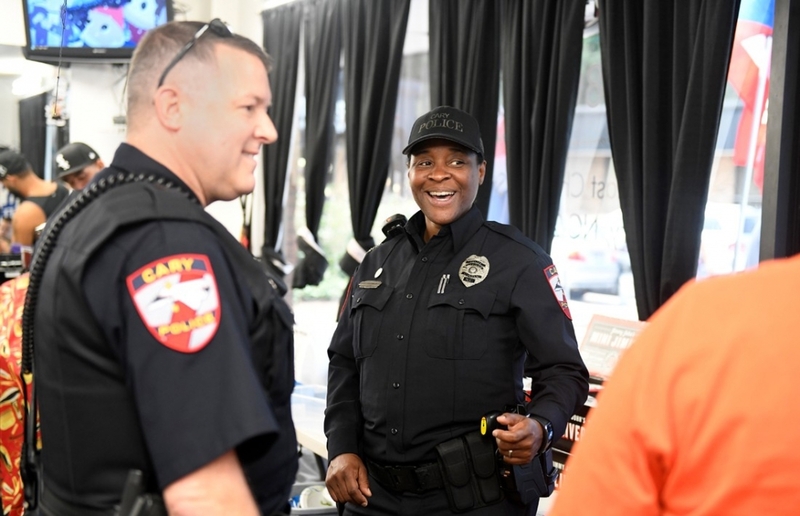 Those discussions resulted in Building Bridges, a partnership between African-American pastors, community members and the Cary Police Department to promote understanding and cooperation. 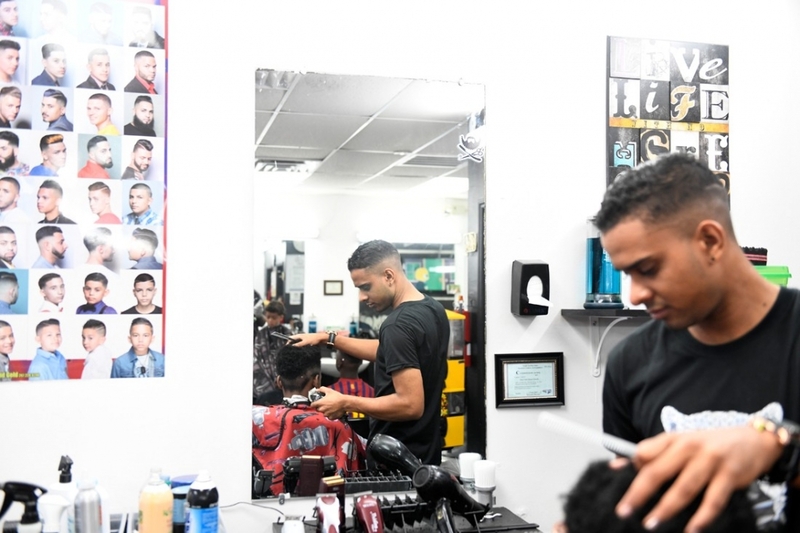 Monthly rap sessions held at local barbershops are part of that initiative. The conversations are facilitated by Pettigrew and other community leaders, so each opinion is given respect and not dismissed, even if others present don’t see things the same way. 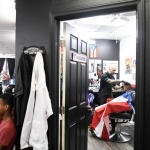 In the beginning, fewer than a dozen people would show up at Headliners Barbershop in Cary, where the first sessions were held. Now 60 to 75 people show up regularly. “If we can take the time to get to know each other, we will realize there is so much more that unites us than separates us. We’re all on the same team,” said Pettigrew. He gets phone calls and emails from participants telling how they now strike up conversations when they meet police officers instead of turning around and heading the other way. Police officers say they are more aware that if someone appears nervous, it might be because of a past experience, not because they have done something wrong. 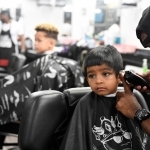 Shlok Makadiya, 5, gets his hair cut by barber Sammie Garris at the Right Cut Barber Shop. 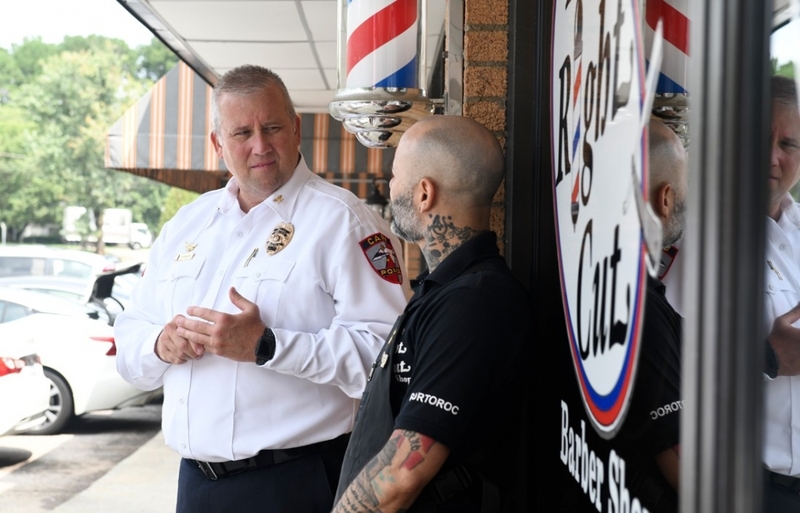 Shop owner Jesse Padilla has invited firefighters to his Kuts for Kids event, but this time he asked Cary police officers. “I figured it would be a great idea to catch the youth, let them see that police are around,” he says. 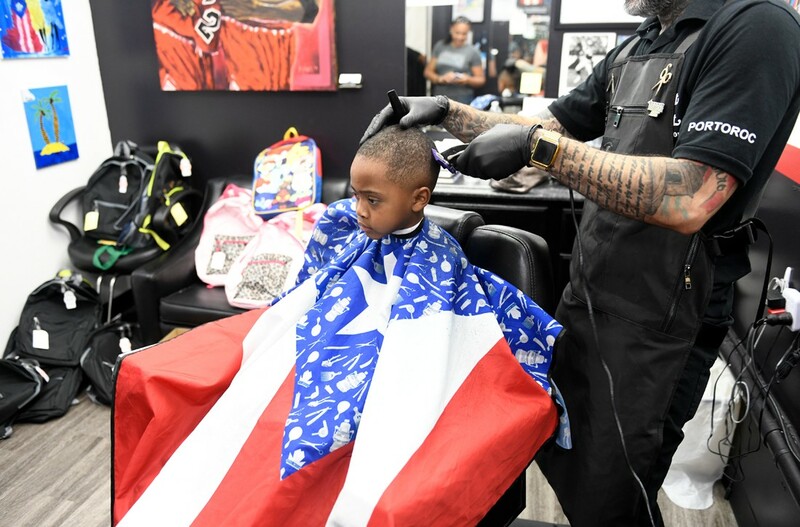 Recently Padilla invited children to his Cary shop, The Right Cut, to get a back-to-school haircut and a backpack full of school supplies. 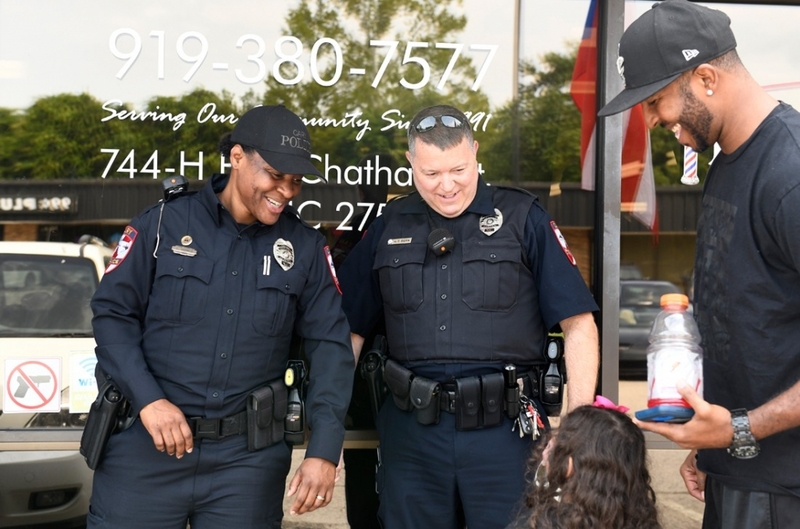 He also invited Cary police officers, so the children and their parents could interact with police in a non-crisis environment. 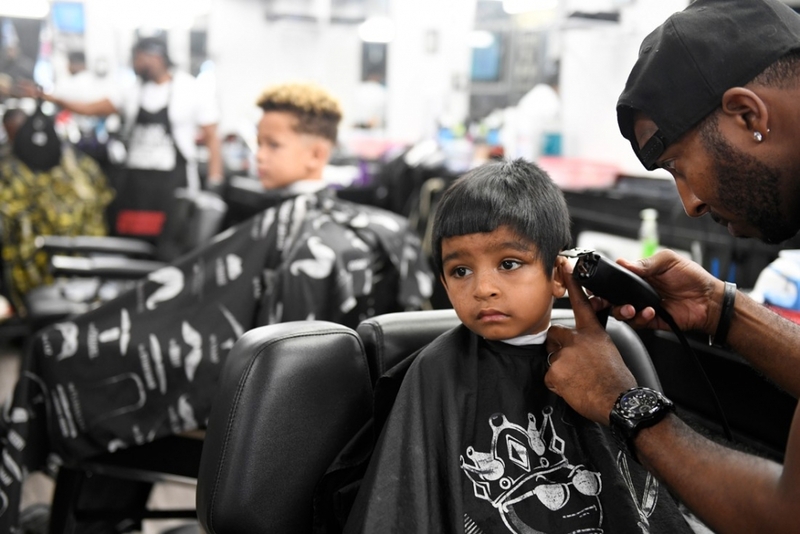 Jesse Padilla, owner of The Right Cut Barber Shop, gives a haircut to Tyson Oglesby, 6. 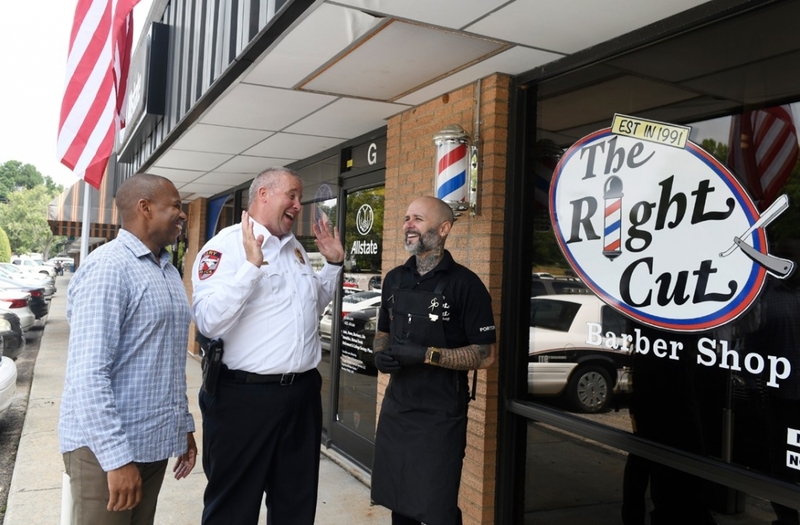 Cary Police Chief Tony Godwin says the barbershop rap sessions have been life-changing. On May 28, 2017, he recalls, Cary police were called to the scene of a burglary, and Shaquian Tyrone Johnson, a 23-year-old African-American man, was shot and killed by Officer A.J. Lopez. But instead of anger and accusations, Godwin and his fellow police officers received words of support. A particularly moving text message came from a barbershop owner who, before the rap sessions, didn’t trust police at all. “I know my Cary PD did what was necessary, and the folks in my neighborhood feel the same way. Tell Chief Tony and that officer, ‘We got your back,’” it read. 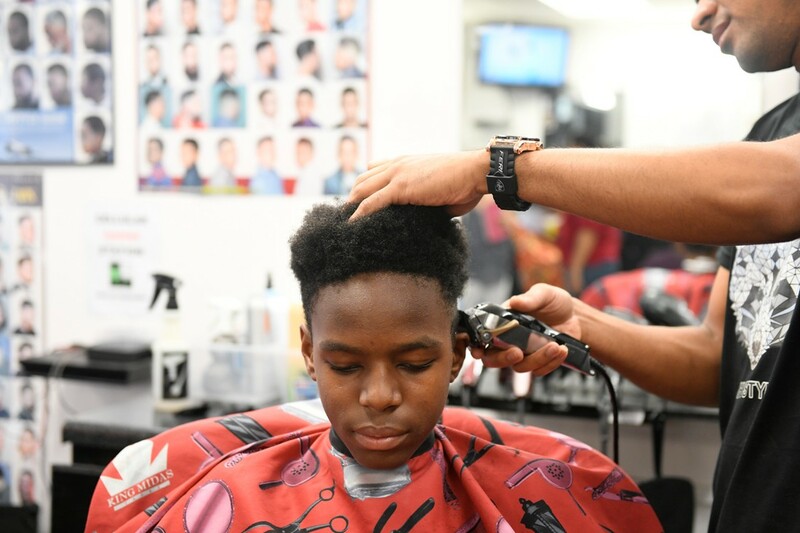 Shamell Watson, 11, gets his hair cut by barber Tito Burgos. 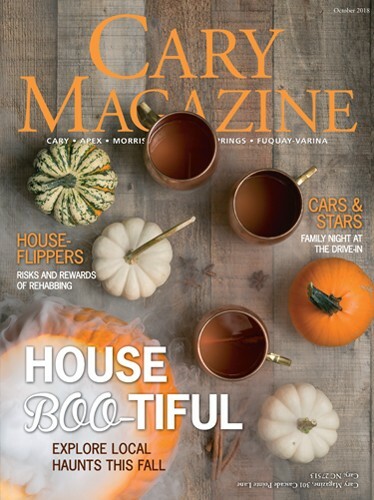 The chief says the success he has seen in Cary can also happen elsewhere. 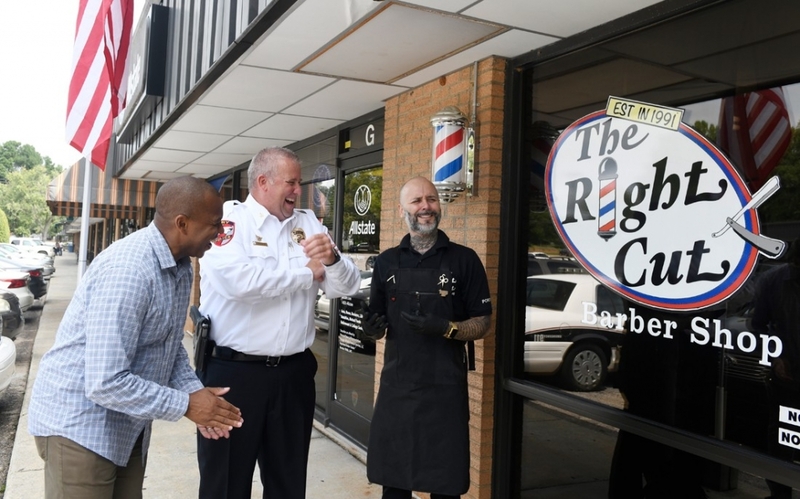 Pettigrew gave a presentation about barbershop rap sessions at the annual conference of the North Carolina Association of Chiefs of Police. 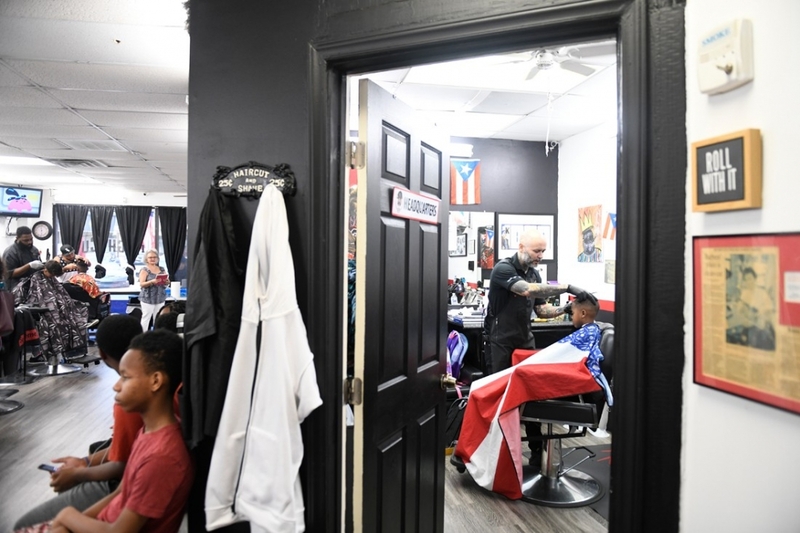 Now roughly ten barbershops across the state — from Fayetteville to Roanoke Rapids — host once-a-month rap sessions. 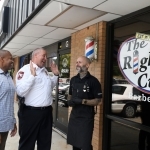 Last year, Pettigrew, Godwin, Chief Cassandra Deck-Brown of Raleigh and Chief John W. Letteney of Apex spoke on barbershop rap sessions at the International Association of Chiefs of Police Conference in Philadelphia. The annual conference draws roughly 17,000 police officers from around the world. 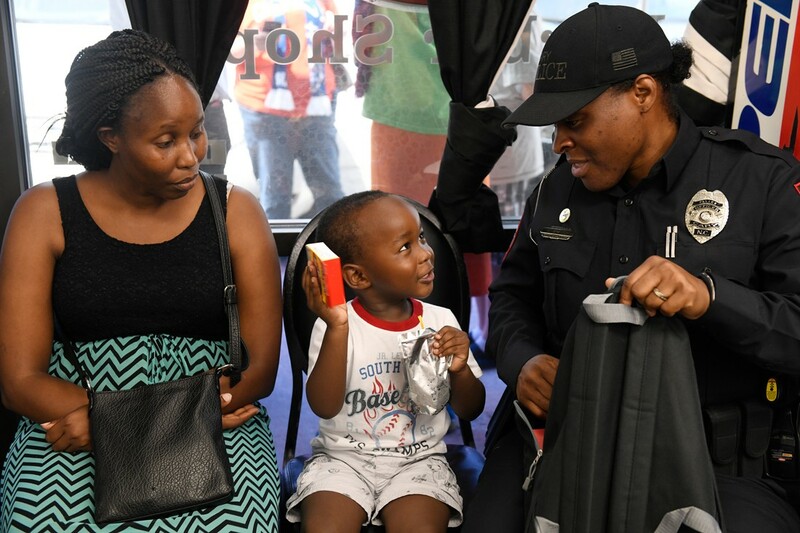 Vera Gekonge, left, and her son Pearson Gerkonge, 3, talk with Cary Police Officer Lekisha Branch at the Right Cut Barber Shop. Godwin says he used to joke that Pettigrew wanted to change the world, but the chief isn’t laughing now.